I always like taking photos with my iPhone. So convenient when running around and you don't have space to carry camera and phone. So that said, I need some lessons on how to make my treats look good. I would like to think the treats speak for themselves but not everyone has the opportunity to see them in their natural habitat. My bestie roomie of all time is a potter...you have met her before. I am always grabbing her "throw aways" and I feel like I could open my own small gallery. I think her little bird plate adds just the right amount of color to the Blanche Bites. Speaking of Miss Blanche, she is really coming out of her shell. In fact she won't stop barking at us. It is only when she wants something. She is really cute but needs a little lesson in manners. She will never get those lessons from her father so it will be up to me and that will be hard because she is the cutest little demon ever! But, I got my new Joy the Baker baking book yesterday and can't wait to break out the mixing bowls for me! It's October!!! It's getting cool around here, luckily still warm enough for people to complain about the temperature. I hope to ride out the sunny heat as long as possible. 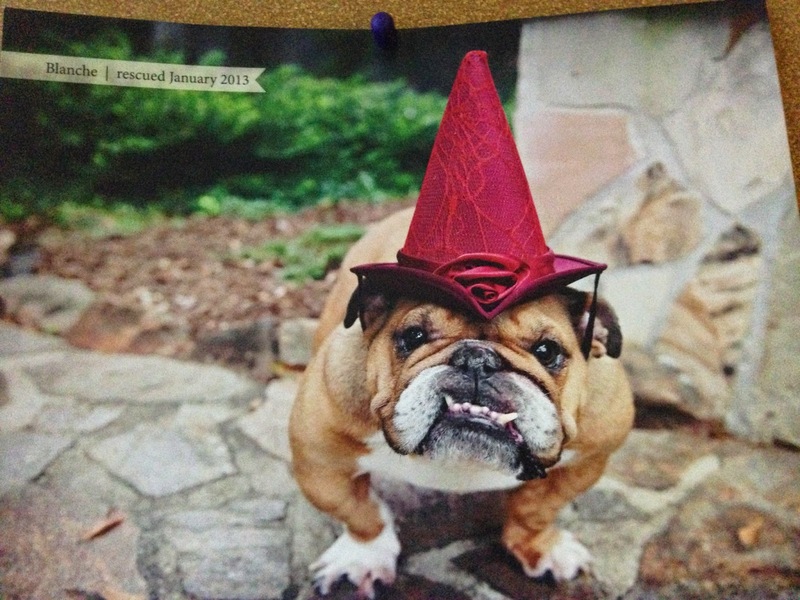 Blanche made her calendar debut for this year and she is a cutie! Who wouldn't want to take this girl trick or treating???!!!!! She is hoping to get some extra Halloween treats and it she is good, who knows. We have been baking a lot to get ready for the Pet Expo in November. No matter if the sales are good or bad, the experience will be worth all of the long hours that are being put into the planning and preparation for it....I think.